Vibrant capital cities, UNESCO World Heritagelisted windmills, battle grounds and magnificent architecture. Get to know Holland and Belgium's past and present during coffees on Antwerp's cobblestone streets and canal cruises through cosmopolitan Amsterdam. Peruse museums and historically relevant landmarks, and end your trip walking the streets of Edam, famed for its delicious cheese. There's tradition and culture in abundance on this inspirational itinerary. Welcome to Amsterdam, where you’ll be met and transferred from the airport to your Emerald Waterways Star-Ship. After boarding, enjoy some time at your leisure to explore Amsterdam. Renowned for its winding canal system, multitude of bicycles and cosmopolitan lifestyle, the Dutch capital is a wonderful beginning to your journey. Enjoy seeing the city’s famed sights, visit world-class museums and relax in quirky cafés. This evening, join your fellow guests for dinner on board. This morning you can decide to either enjoy a glass top canal boat tour through Amsterdam’s canals or join the EmeraldACTIVE guided bike tour. Return to the ship for your first day sailing through the Dutch countryside passing windmills and sailing through locks towards the Rhine River. Tonight the Captain will be delighted to host a gala dinner. 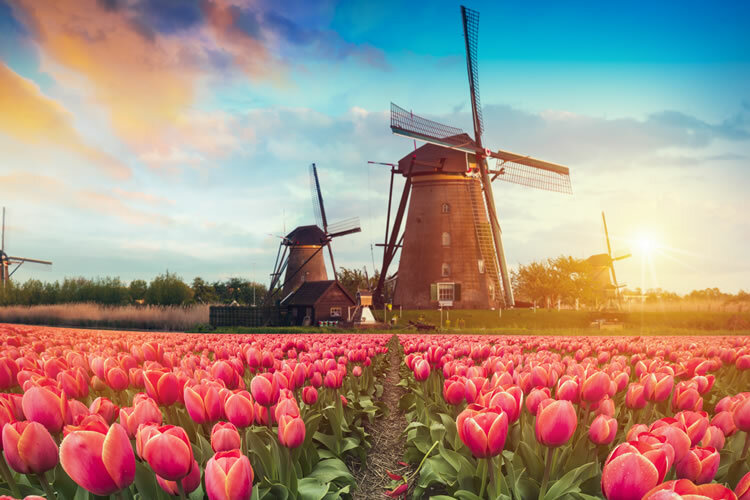 This morning enjoy a guided tour of Dordrecht; the oldest city in Holland, before travelling to the Kinderdijk Windmills, a UNESCO World Heritage site. This unique collection of nineteen authentic 18th-century windmills is considered a Dutch icon throughout the world. Your afternoon is at leisure to relax on board or explore the city of Dordrecht further. After a relaxing morning spent sailing through the Dutch waterways, arrive in Maastricht, Holland’s oldest fortified city. Your city tour will provide you the opportunity to pass by many museums, churches, historical buildings, hidden alleys and squares. You will be amazed by all the different architecture found in the city, ranging from Roman excavations to the modern design of the Bonnefantenmuseum. Arnhem is most famous for its great battle during World War II, its iconic bridge - the sight where the British forces were captured. Today you will tour the Airborne Museum Hartenstein which is dedicated to the Battle of Arnhem In 1944. The main building was the headquarters of the British command during the battle, and now houses exhibits of military uniforms and weapons. This morning you will arrive in Hoorn, which was once a base for the Dutch East India Company, making it a prosperous and powerful trading town. Today, this 13th century town is home to many listed buildings and the former Oostereiland prison. Once in Hoorn, you will be transferred by coach to Edam - a town known all over the world for its cheese, where you will enjoy an orientation walking tour. Afterwards, you will be taken on an orientation tour of the fishing village of Volendam, followed by free time for exploring the small fishing port and the old centre where some residents still wear traditional Dutch costume. EmeraldPLUS: log Painting on board. EmeraldACTIVE: Guided Bike Tour in Hoorn. After breakfast, it is time to bid farewell to your fellow passengers and disembark the ship for your transfer to the airport and your onward or homebound flight. 20 On-board meals: 7 breakfasts, 6 lunches, 7 dinners including a Welcome & Farewell Gala Dinner. Complimentary wine, beer & soft drinks to accompany lunch & dinner on-board. Complimentary tea & coffee on-board. Complimentary bottled water in your suite or stateroom, restocked daily. 5 Shore excursions, including visits to several UNESCO World Heritage Sites. A variety of on-board evening entertainment. First-class service from English-speaking crew and knowledgeable local guides. All port charges, airport taxes and transfers within Europe. All tips included, saving you up to £235 per couple.